This LED Par Can also features: 32 Color options, Electronic Dimming (0-100%), IEC AC IN and OUT and a 40-degree beam angle. 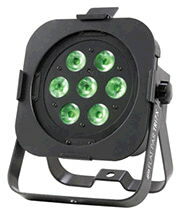 The Flat Par TRI7 s LED only pulls 25-Watts of power per fixture. * Please call us for any questions on our led flat par tri 7x light rentals in Ft. Wayne IN, Warsaw, Syracuse, Auburn, South Bend, Indianapolis IN.